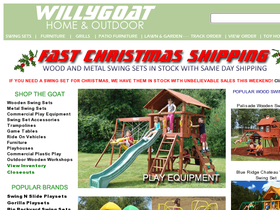 WillyGoat Inc., online at WillyGoat.com, offers a wide variety of home & outdoor furniture, as well as a great selection of outdoor toys, including swingsets and trampolines. WillyGoat carries unique furniture for all types of activities, homes, and interests. Carrying dozens of brands and thousands of products, at WillyGoat they want to make furniture shopping easier. WillyGoat carries a full selection of game tables, games, accessories and more for all of your family to enjoy. To save on your next WillyGoat purchase visit 58Coupons.com to learn about all the best WillyGoat discounts, WillyGoat deals, WillyGoat promotions and WillyGoat coupons available. Check out the many items available in the Home & Outdoor Specials, where some are discounted up to 35%. Shop WillyGoat.com, and check out select items in their Toyland or Home & Outdoor stores that qualify for free shipping. Save $25 off your purchase of a Little Cottage Outdoor Shed or Playhouse at WillyGoat.com. Simply click the link to activate this deal. Save yourself $15 on the purchase of any outdoor trampoline at WillyGoat.com. Just click the link to activate these savings. Save yourself $15 on the purchase of a wood or metal swing set from WillyGoat.com. Simply click the link to activate this deal. Save $10 on your furniture purchase of $200 or more at WillyGoat.com. Click the link to activate this deal.